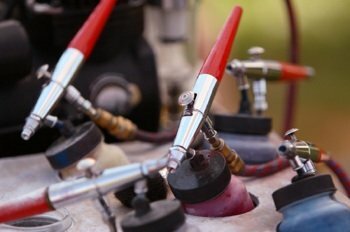 Airbrushing is a valuable tool for many applications in model railroading, including painting models and scenery – e.g., structures, bridges, model trains (locomotives and rail cars), tracks, trees, rocks, mountains, backdrops, ground cover, etc., etc), not to mention its benefits in many weathering projects as well. It provides a much smoother finish than regular brushing, and the results tend to be much more realistic and professional in appearance. The single-action is the easiest of the two to use and clean, and it works very well for most model railroad work. There is one button to push to activate the airflow, which then pulls the paint out through the nozzle onto the surface of the model. 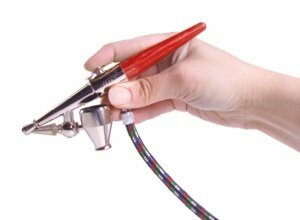 The amount of paint that comes out can be adjusted by turning the paint nozzle, which houses the tip. The air and paint are mixed outside the airbrush as they flow toward the model. The double action, on the other hand has one button that controls both the air flow and the amount of paint flow. If you push down on the button the air begins to flow, and if you pull the button backwards, the paint begins to flow. The amount of paint that comes out depends on how far back you pull the button. 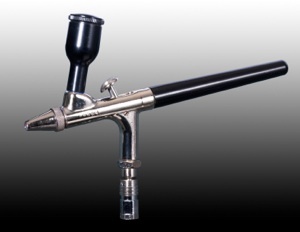 With this device, the paint and air are mixed inside the airbrush. Maneuvering the control on this airbrush takes more practice, but once you’ve mastered the technique, you have much more control over how the paint goes on. To protect your lungs and sinuses, you should use a mask regardless of which device you are using. Also, it’s a good idea to use a spray booth that is ventilated to the outside air. 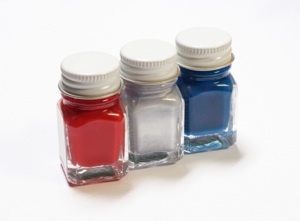 This is especially important if you’re using solvent-based paints. It keeps the paint particles from being dispersed all over the room, all over you, and all over your other models that you’ve already painted with another color. You can buy pressurized cans of compressed air for short-term use, but if you do a fair amount of spray painting, this may get expensive. Therefore, investing in a small air compressor will probably save you money in the long run. The compressor should have an air regulator so that you can set a pressure of about 15-25 psi. Start with a lower psi and increase if you need to for more airflow. Solvent-based paints usually require less pressure than water-based acrylics. Also, if you’re using acrylics, it’s generally a good idea to use the larger tip; acrylic paints tend to clog up the smaller tips. Floquil is a solvent-based paint that should be diluted with Floquil Thinner 3:1 for use at a pressure of about 12 psi. Polly Scale is water-based and should be diluted with either water or Polly Scale Thinner 3:1 used at a pressure of 15 to 25 psi. Practice on a piece of old cardboard first. With the paint nozzle closed, press the button to just get the air flowing. Then slowly open the paint nozzle until the paint starts flowing. When you’re ready to start painting. Aim the nozzle to the side of the cardboard and push the button. After the paint begins to flow, then move the airbrush over the cardboard in a smooth horizontal line holding it about 3-6 inches away from the surface. Once the spray leaves the cardboard on the other side, then release the button. Continue to do this back and forth across the cardboard to get a nice smooth thin coverage. Once you’ve mastered the technique on the cardboard, you’re ready to move up to real models. Remember to always start by painting a thin coat of paint over the model. If you try to put too heavy a coat on, the paint will run, pool, sag and dry unevenly. It’s much better to apply 2 or 3 thin coats allowing for proper drying in between each coat. It’s very important to clean your airbrush after each use. Follow the directions that came with it for thorough and proper cleaning. Otherwise, you will find yourself with clogged nozzles and poor results the next time you try to use it. You shouldn’t shy away from using this technique as many people do. It’s not that difficult to master and cleaning only takes a few minutes once you know how to do it. It’s a great tool to use for model railroading and a great craft to learn, in and of itself. And besides, it’s fun! From "Airbrushing" to "Model Railroad Buildings"